Note to editors: To aid your reporting of forthcoming announcements relating to Rugby World Cup 2023 bidding, below is a summary of the process being followed and the next steps. Beneath that is further background on the process since inception and links to key materials and documents relating to South Africa’s bid. Fifteen months of a 16-month, two-phase process have now been completed for the three bidding rugby unions: South Africa, France and Ireland. We have reached the critical stage with two formal steps remaining. STEP 1: At 13h00 (SA time) on 31 October, World Rugby will announce the Rugby World Cup (Ltd) Board’s recommendation for the host candidate, depending on which has achieved the highest score in an evaluation process. Please note: This is not the final outcome; that will be determined on 15 November (see below). The assessment has been performed by a team of 10 World Rugby, RWCL relevant-area managers and independent area experts, working since 1 June 2017. They have assessed all three bids with input from functional experts. The London-based Sports Consultancy has scrutinised each managers’ evaluation to ensure all candidates have been treated fairly and the criteria have been consistently applied. The evaluation report will be sent to host candidates and World Rugby Council members. At the same time World Rugby will announce the Evaluation Commission’s findings. None of the three bidding nations are permitted to vote. The bid which receives a simple majority of the 39 available votes will be named as the host for Rugby World Cup 2023. Those eligible to vote in the secret ballot will be Australia (3 votes), England (3), New Zealand (3), Scotland (3), Wales (3), Italy (3), Argentina (3), Canada (1), Japan (2), Georgia (1), Romania (1), USA (1), Asia Rugby (2), Oceania Rugby (2), Rugby Africa (2), Rugby Americas North (2), Rugby Europe (2), Sudamerica Rugby (2). In the event that none of the host candidates receives a simple majority in the first round, the candidate with the least number of votes will drop out before a second ballot. The host country will be announced at a media conference immediately after the vote at any time from 15h30 (SA time), depending on how long the vote takes. Designed to ensure that only qualified Unions and countries continue to the second phase. Italy withdrew at this stage, leaving only France, Ireland and South Africa. A senior Rugby World Cup Limited (RWCL) delegation, including the World Rugby CEO, CFO and RWCL lead visited South Africa. The visit included a day-and-a-half of presentations in Cape Town and a tour of the National Stadium in Johannesburg. SA Rugby submitted South Africa’s bid to World Rugby in Dublin. The bid, which ran to more than 800 pages and 16 chapters addressed 300 questions. It included a comprehensive budget and a detailed match-venue file providing exhaustive information on each proposed venue. A PDF summarising the bid submission can be downloaded by clicking here. Please note, the file is 31Mb in size. Alternatively, it can be read online. Legal guarantees from National Government, all proposed match venues and the hosting agreement between SA Rugby and RWCL were submitted by the deadline. The final stage of the candidate phase was a 30-minute presentation to World Rugby Council members, followed by a 20-minute Q&A. France, Ireland and South Africa each presented their vision for the 2023 tournament and key aspects of the bid. The Minister of Sport and Recreation, Mr Thulas Nxesi, and SA Rugby President, Mr Mark Alexander, introduced the South African bid. 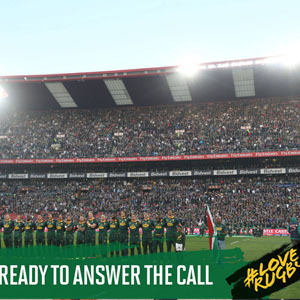 SA Rugby CEO, Jurie Roux, presented the technical detail and South Africa’s 10 differentiators. The Deputy President, Mr Cyril Ramaphosa, closed the presentation. South Africa’s 10-point undertaking to World Rugby can be accessed by clicking here. The 12-member presentation party included South Africa’s two Rugby World Cup winning captains, Francois Pienaar and John Smit as well as the Director General of Sports and Recreation South Africa, Mr Alec Moemi. There were two videos in the presentation; one showcasing South Africa and its people’s passion for rugby, and the other our match venues. Visuals in these videos are courtesy of SuperSport, SA Rugby and SASCOC. T: 021 928 7010 / 082 926 0789. This message and any attachments are confidential and intended solely for the addressee. If you have received this message in error, please notify the sender immediately. Any unauthorised use; alteration or dissemination of the contents of this email is strictly prohibited. In no event will Meropa or the sender be liable in any manner whatsoever to any person for any loss or any direct, indirect, special or consequential damages arising from use of this email or any linked website.